Summer is here in New England and hopefully all are out and about doing what they like to do when the weather is warm. If anyone complains of heat and humidity I am going to send them right back to February so they remember what cold feels like! 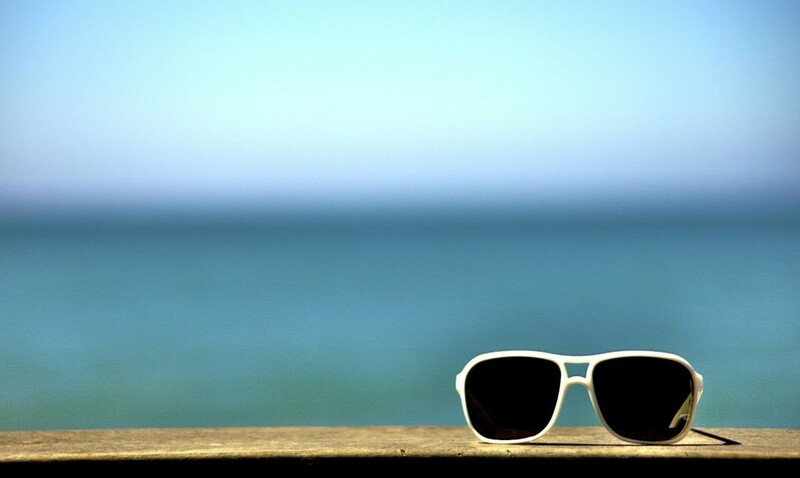 I am a sun and fun lover so you won’t hear me complain…no summertime blues for me! Blue shows up in veterinary medicine in a handful of different ways. We have blue-eyed dogs and Russian Blue cats, blue merle coloring and Blue Amazon parrots. 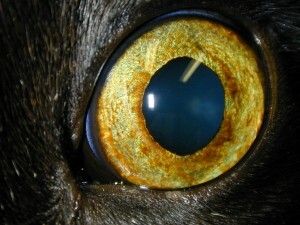 When the eye is blue, that usually refers to the cornea which can get a bluish caste to it with many disease processes. What is going on when this occurs? The cornea is clear window in the front of the eye that allows the light to pass through it on the way back to the retina. Clarity is essential here and many diseases processes will negatively affect the cornea and alter its appearance and function. A lecture I commonly give to general practitioners prompted by a good friend and mentor Dr. Chris Murphy boils down these changes to seven distinct corneal opacities. The one attributed to the blue color is called edema. Edema is essentially fluid that gets into tissue which makes it swell. A strict definition would be “the accumulation of an excessive amount of watery fluid in cells, tissue or cavities”. As you can imagine, this occurs in many locations in the body such as your ankles if they swell up after a long day of hiking. This may or may not be associated with inflammation and many times is not uncomfortable. When referring to the cornea, this fluid can come from three locations. First is from the tears. The cornea is in many ways a very fancy, clear skin. When in its normal state the tears moisturize and flow off just like water on skin. If there is a scratch or erosion on the surface, the protective outer barrier is breached and this fluid can now gain access to the deeper tissue. This will give the erosion a tint if not complicated by bacteria, vessels and other entities that will affect the clarity depending on the source of the erosion. Once the surface tissue heals, the edema will resolve. Secondly, blood vessels can create edema. Vessels will enter into the cornea as a result of many issues, be it trauma, non-ulcerative inflammatory change, low-grade chronic irritation to name a few. As with vessels in any part of the body, elements from the blood stream can seep out of the vessels and into the local tissue if the integrity of the vessel is changed. 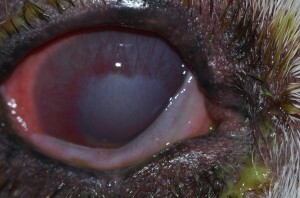 Thus, a watery fraction of the blood can leak into the cornea creating a blue haze that surrounds the red vessels. This haze may resolve as the vessels regress when appropriately treated. 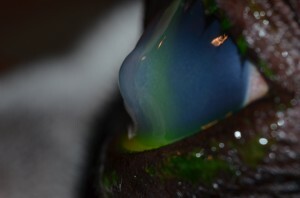 Lastly, fluid from inside the eye can leak into the cornea. Similar to the external surface, the internal surface of the cornea is a barrier to fluid migration. On the outer surface, the cornea is also exposed to air and we need to protect against drying by blinking to distribute the tears. We can also alter the amount of fluid present based on comfort, health and emotion. The internal surface, contrarily, is constantly bathed in fluid like the inside of a fish tank. This internal surface is built differently with a layer with pumps called the corneal endothelium that actively pulls fluid out of the cornea. If these pumps quit working properly more fluid will migrate in than gets pumped out. 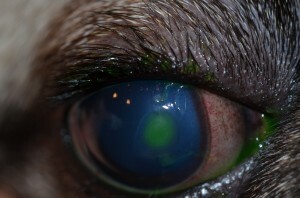 When this occurs, the cornea swells like a new sponge when it gets wet and, voila, it turns blue. Unfortunately, we only gets so many pumps at birth and can’t make new ones. So if these cells are not built right, become damaged, or start degenerating there is very little we can do in veterinary medicine. 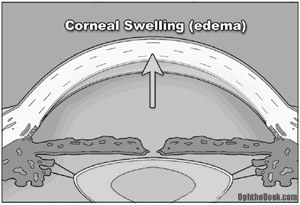 Treatment of cornea edema then relates to the underlying cause. If associated with a surface defect, topical antibiotics or manipulation of the corneal surface as described in our post about indolent erosions may be warranted. If secondary to inflammation, a topical antiinflammatory like a cortisone or aspirin-based drug may be appropriate. And if the endothelial layer is faltering, we may need to treat for the intraocular disease that is creating it like glaucoma or uveitis. And if degenerative change or developmental anomaly is at the root of the problem we may be relegated to following for discomfort rather than trying to “remove” the fluid. In humans, a corneal transplant with a fresh, healthy, viable layer of pumps can be utilized to improve the clarity in patients with primary endothelial disease. This does not work in our patients to date due to the resultant inflammation from the procedure itself that will form a scar of the donor graft rather than maintaining clarity. This is truly unfortunate as lots of older dogs and predisposed breeds like the Boston Terrier will get dense edema that will ultimately affect the quality of their vision. A newer surgical option is a procedure called a keratoleptynsis, or Gunderson Flap, where a thin graft of conjunctiva is placed over the edematous region. The theory in part is that the graft can act like a sink and pull fluid out of the adjacent cornea. 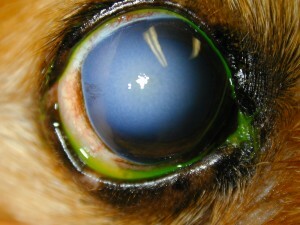 Recently, veterinary ophthalmologists have been attempting this earlier in the course of the disease to try and delay the development of the edema in adjacent clear cornea. This is also an option in some cases if ulceration and its associated discomfort is frequent and to prevent repeat ulceration in the future. Where can discomfort come from? In cases of extensive edema, the fluid may start to accumulate under the external surface and form blisters rather than maintaining in the swollen sponge mode. Most are small but some can be quite impressive as shown in the image below. If these smaller blisters rupture a superficial erosion will now be present that can be a challenge to heal in such a soggy environment. In this situation, salt-based ointments may be used to try and locally dehydrate the blister to help it heal and may be needed as a maintenance drug to prevent blister formation. Sometimes surgery is necessary to stabilize the region if it is too wet to heal normally. There’s more we could talk about but I will save that for another day. It’s nice outside so we are heading out to enjoy it! Have a great summer!